Vacation rental house. Sleeps 6, 2 bedrooms, 2.5 bathrooms. No pets allowed. The home is situated close to the water. Large boulders full of sea life line the shore. Back upstairs, the view stuns you again. A sailboat anchors out between the home and Indian Island. A corner of Orcas that gives you that Island feel. La Maison by the Sea is a lovely new home tucked into an incredible waterfront location. 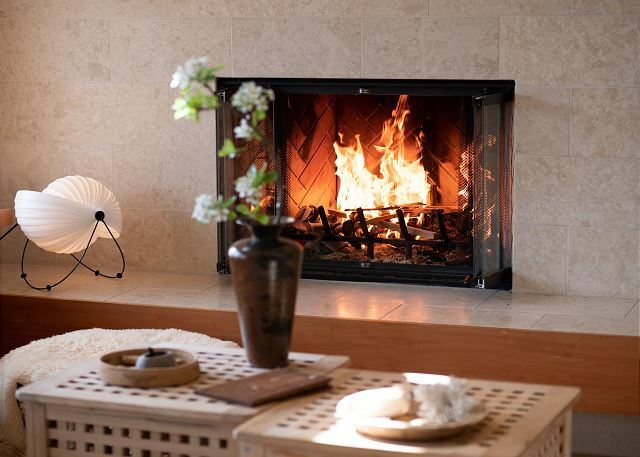 It’s just what you visualize when dreaming of a romantic island getaway or solo retreat, a place to sit at the shoreline in the summer sun or snuggle by the fire on a blustery day. 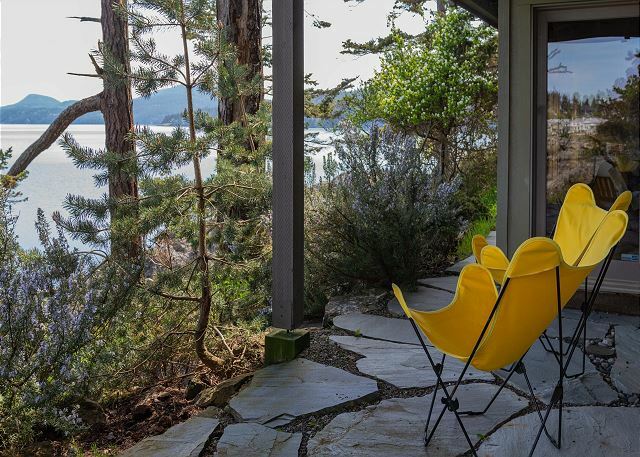 Located on a scenic point with dramatic views stretching down East Sound and toward the eastern hills, La Maison provides an elemental environment, yet it’s also conveniently located within a short walk of the shops and restaurants in Eastsound Village. If you're the lucky one to reserve the popular 4th of July week, you'll enjoy front row seats for an exceptional fireworks display, usually launched from a barge moored right in front of the home. You'll also be able to avoid traffic and walk to the Eastsound parade and holiday events - participating in the celebrations of this close-knit community is a joyful and touching experience that's well worth a small premium! Outdoors, this little gem is wrapped up with nature, but the interior has a contemporary European flavor. 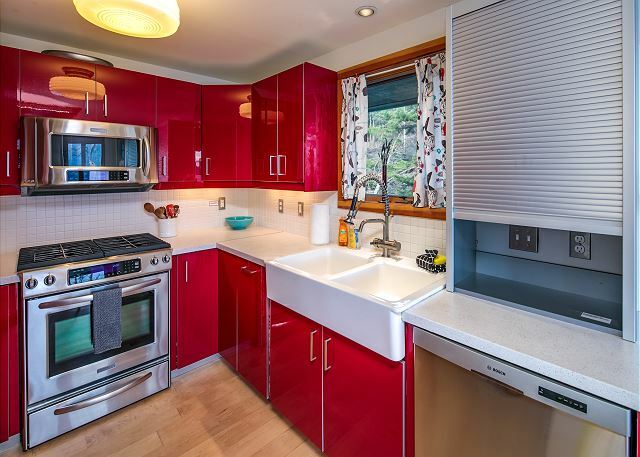 The décor is spare, light, and accented with vivid colors including red lacquer cabinetry in the kitchen. 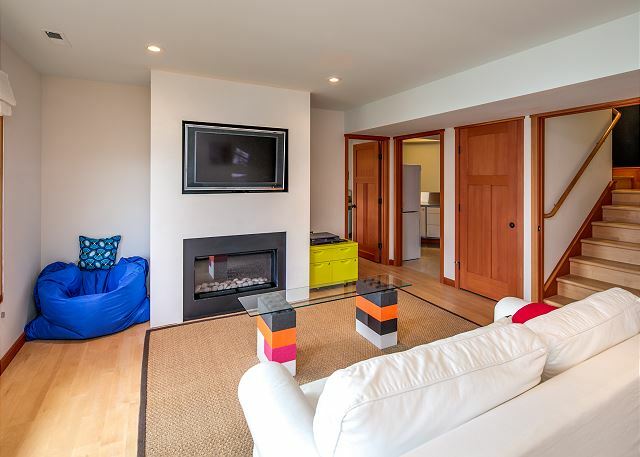 There’s a wood burning fireplace upstairs, and a “line of fire” to enjoy in the lower family room where the television is located. The master bedroom is on the main level and features a queen size bed; the master bath offers an elegant slipper tub with overhead shower. Downstairs, you’ll find a second bedroom with a queen size bed, a second bathroom with shower, a den with flat screen TV for viewing movies with BluRay DVD, and laundry room. There’s a wonderful deck with BBQ and seating off the upper dining area; the lower level patio and paths are of flagstone. This is a "shoes off" home with raw wood floors and delicate furnishings best enjoyed by adult guests only. Please note that there is a flight of stairs leading down to the front entry and that parking is limited to two small autos, or one SUV type vehicle. This home does not allow guests 6 years or under. A very nice rental. Becky, the local facilitator, answered her phone and helped us out with a few wrinkles upon our arrival. Joe, the local handyman, came and fixed a light bulb and explained everything that confused us....and it was clear sailing for the rest of our stay. The house is well-equipped with everything you might need for a short stay...and then some! The view from the deck is A++. The walk to town along the main road is a bit precarious, but short and sweet. The beds were totally comfortable and made with fine linens and down pillows. The TV (DVD player only!) worked well, as did everything else. The closets were functional. The books and games were an adventure. Almost. 1. The BBQ needs a thorough cleaning. The gas ports were clogged with grease and hampered our grilling operations. 2. The particular way (lift up handle, then turn lock) to lock the deck doors need some handy instruction for new guests. 3. The Euro-lighting switches need some practice to master. They all work a bit differently and the switches are many! 4. 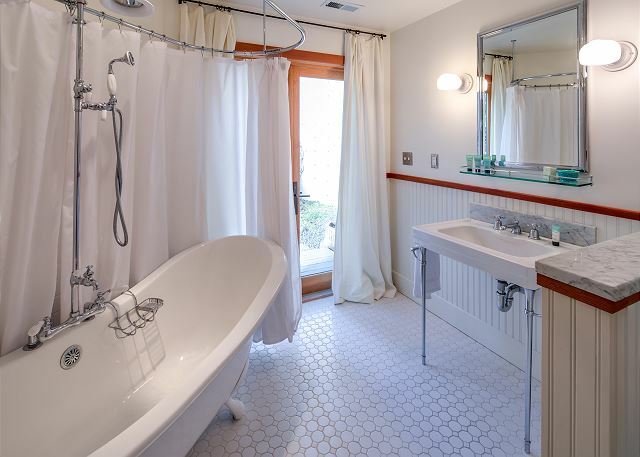 The main floor bathroom is "over-kill" with its extravagant tub-shower combo. And the toilet in this same bathroom is not a strong flush. It also requires the right "touch" to operate...or the flapper does not close, causing the toilet to run continuously. Other than those small was 100% PERFECT! We really enjoyed our stay at La Maison by the Sea. It is a stunning location, private yet conveniently a few minutes walk from town. At 7:05am each morning, a family of 7 river otters would come by and we would watch them eating their breakfast. We also saw the occasional seal. The kitchen is nicely set up. There's even an ice cream maker. We grilled simple meals out on the porch and enjoyed the sunrise and sunset every day we were there. 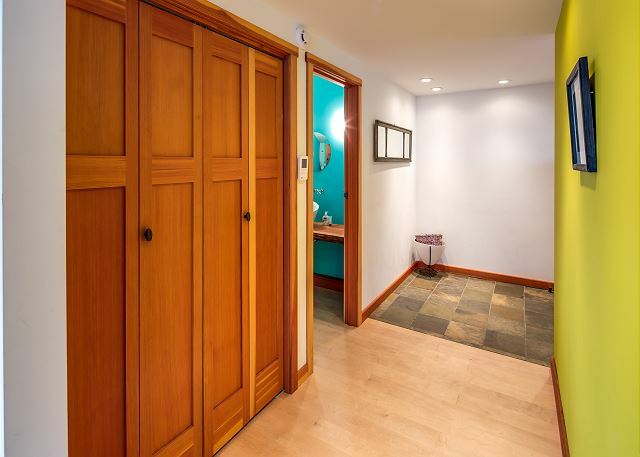 So many elements of the house rental are well thought out -- there's a handy flashlight in the coat closet, a nice table to fold clothes in the laundry room. The management company is very responsive. We were there on a holiday weekend and there were 1-2 small matters and they attended to them right away. If I had one suggestion, I wish there was a more comfortable chaise lounge for the deck. It is so beautiful, I could have stayed out on the deck reading the entire day! We moved some more comfortable chairs from inside to make it work. Highly recommend this house for its location and atmosphere. The house is beautiful with everything we needed. A few steps to Eastsound. We have stayed there two years in a row, and will probably try to stay there again next summer. We just got back from our 5 day honeymoon on Orcas Island! The LaMasion House is so beautiful and just added to the amazing and relaxing time we had there. We loved having coffee on the deck every morning and walking into town at night. The house is centrally locates to all of the fun things we did during the day.... Moran State Park, Turtleback Mountain and oyster shucking in Olga. Thank you so much, we had a wonderful time and can’t wait to return! 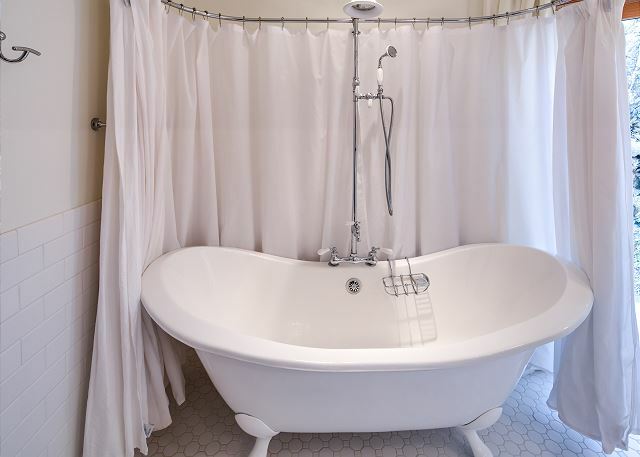 The property was beautifully maintained but needs a few handy item fixes - the master shower. The kitchen also needs to be stocked with more cooking items for people who like to cook, more than just the basics. My family of 5 stayed at LaMaison for 4 days in July. It was a beautiful home with high quality finishes on a spectacular point of waterfront. One morning I awoke, looked out at the view as a Bald Eagle flew by the window. This home is on high bank waterfront with a view of and walkable to Eastbound, as advertised. The kitchen is very well equipped and the accommodations comfortable and relaxing. Figuring out how to use some of the appliances and doors did require reading the manuals provided. I would stay here again. We had an wonderful time here…LOVED the place, location. I don't think the pictures do this place justice. We loved the decor, the location and all the details that made this place comfortable. All of the amenities were great. My whole family enjoyed our time at La Maison by the Sea. The home was beautiful and in a beautiful location. 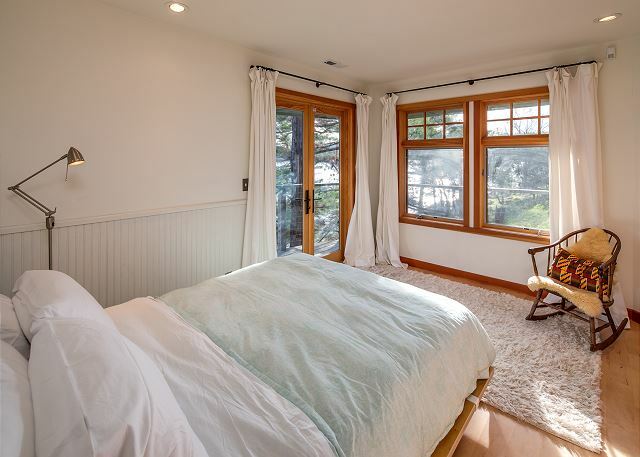 Although I was out exploring the island during most of my stay, I was happy to come back to a comfortable bed and stunning views at this lovely home, conveniently located within a quick walk to Eastsound amenities. My needs were fully met, but I would recommend reading the other comments about the furnishings, layout, and features of the home before deciding whether it's a good fit for your vacation. Everyone had an absolutely wonderful time at your home!! It was exactly as described, and we loved having a very well equipped kitchen to stay in, cook and enjoy the beautiful views of Eastsound! La Maison by the Sea was everything we expected and more. Great house, awesome location for discovering the island and you can fall asleep and awake to the sounds of the waves lapping the shore. My husband, adult daughter and I stayed at Maison by the sea. It has a lovely view and is close to East Sound a charming tourist town. It has 2 beautiful bedrooms 2.5 bathrooms with a full kitchen and good quality furniture. The house was clean and well cared for, however it did have eccentricities. The master bedroom's bed was a (less than comfortable) thin futon while the 2nd bedroom had a very comfortable normal box spring and mattress. Despite having fancy tv's there is no tv reception or cable although their is wifi. We did enjoy the scrabble game and books there. The problem we encountered was with the management company. We wanted a top sheet ( there was no top sheet) and light blanket instead of the duvet with a very warm down comforter inside ( in colder weather it would be cozy). They never brought either a light blanket or sheet so we just used the duvet cover without the comforter as a sheet/blanket. Hard to believe that paying more than $2000 for 4 nights we couldn't get one sheet and light blanket. The management personnel were pleasant as we made the reservation but were not terribly helpful later. All in all the beauty of the view overcame the shortcomings but i would carefully read the details and make sure that one couple likes futons and heavy down comforters. My wife and I stayed for a week and thoroughly enjoyed our stay at this rental home. 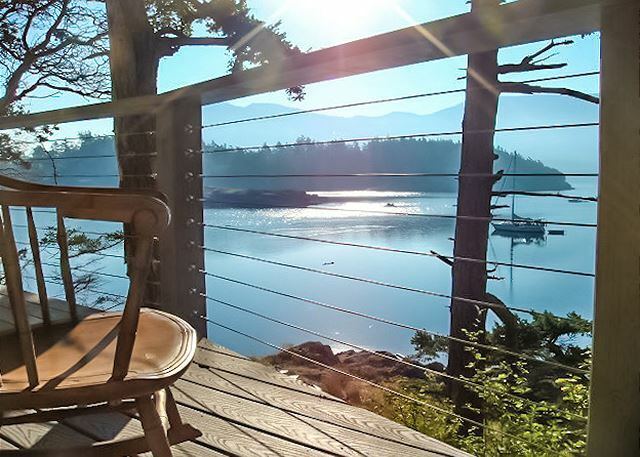 The view is incredible, the property is quiet and peaceful and your only a 7 minute walk to Eastsound! All of the furnishings are in perfect shape and the bed very comfortable. The only thing we would have changed was the master bathroom tub/shower arrangement. It's a nice tub for bathing but not very suited for showering. The downstairs tub/shower is more traditional and is what we ended up using. Beautiful location right on the water. Close enough to walk to town. Really a great place! You can rent kayaks right around the point and kayak around Indian Island. Very fun. Not too far from Moran State Park, there's a great hike up Mt. Constitution. Great 4th of July Getaway! We stayed at La Maison over the 4th holiday and had a fantastic time. Beautiful home with ridiculous views and wildlife out your back door. And an easy walk to the cute town of Eastsound for food and shopping. Lucky to have found this place, and we will most definitely return! I loved staying at this property! The arrival experience was less than desirable, as the directions provided were confusing, and the GPS was wrong (the lesser of the two evils was the directions provided). When the home recommends it for mature adults, it means that the beach is very rocky, and dangerous for small children. We did see several starfish in the rocks outside the house on our first night, and the morning we left there was an otter playing on the rocks outside. What an amazing spot. The amount you arrive, you will smile and realize this was a good decision. Spectacular view of the water through a Madrona and Douglar Fir tree. Your own private beach perfect for tide pooling. Completely peaceful and quiet. And you can walk in 5 minutes to downtown EastSound. You can't go wrong with this place. Enjoy! PLUSES: CLEAN, CONTEMPORARY DESIGN, ATTRACTIVE COLORS, LIGHTING. MODERN KITCHEN & APPLIANCES; WALK TO TOWN. MINUSES: DANGEROUS, UNLIGHTED STEPS FROM PARKING AREA TO FRONT DOOR; FURNITURE MORE FASHION THAN COMFORT; APPLIANCES NEW/NICE, BUT REQUIRE READING MANUAL TO OPERATE; GROUNDS IN NEED OF MAINTENANCE; NO FIREPIT. FIREPLACE IN DOWNSTAIRS SUITE DIDN'T WORK. GET CABLE, NO WORKING TELEVISION. UPSTAIRS BATH PRETTY, BUT A PAIN TO USE. NEED MORE CHAIRS, LACKS SEATING FOR FOUR PEOPLE IN SITTING AREA. We were on Orcas Island for a wedding with our two adult children and their partners. The location of the house is spectacular! You feel secluded and away from the hustle and bustle of Eastsound. Very comfortable main living and dining area. Only minor complaint would be that the kitchen could be a bit better stocked with spices. Loved the location and the view. Lovely, well maintained newer home. However, lacking a few expected comforts. Only four pillows provided for a home rated as sleeping six. Most high end hotels, inns and homes provide two per person. Furniture more form than function. Beautiful view experience would be enhanced with more comfortable seating on the deck. Living room seats only three in any comfort. Still a beautiful home and delightful island experience. Our family had a wonderful stay at this property - we definitely hope to return! The location (on the water and walking distance to town) was perfect. Kitchen had everything we needed to cook great meals at home. My only (small) suggestion would be to provide a couple extra pillows. Great vacation - really enjoyed the home and the islands. unbelievably beautiful and isolated-feeling location and home, just steps from town on a point looking straight down the sound. every morning was a unique gorgeous mix of fog, clouds, water, sun and mountains. perfect for two couples -- upstairs and downstairs "units" with shared kitchen (upstairs) and den with gas fireplace and giant TV (downstairs). Can sit and read in living room or porch or on rocks down by the water. Centrally located to all other beautiful island sites. A wonderful week. The home is just lovely! While it is very quiet, it is conveniently close to town. The property management was also very easy to work with. We just have two suggestions for them: 1) More than one kitchen towel would be useful 2)The directions provide a slightly different spelling for the road than what it is in real life; there is also an easier turn-off than onto the "overgrown" road. Thank you! Beautiful home and location. My children enjoyed finding starfish in the tide pools directly out front at low tide. Very comfortable and impressive. The location of this vacation rental couldn't be better. 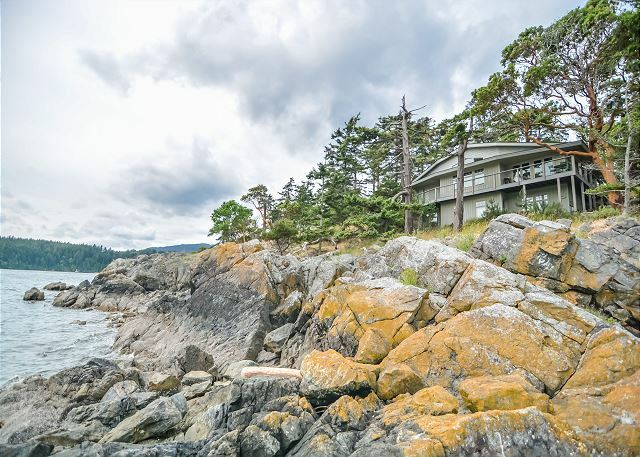 Right on the water and an easy walk to Eastsound. Beautiful Madrona tree drapes itself over the deck and there is a feeling of privacy despite neighboring houses. This is a nice set-up for two couples with upstairs and downstairs living spaces. That said...if you are renting to four people, there should be four comfortable seats in the living room. A small loveseat and easy chair were the only comfy seating spots,leaving one person chairless. Seating on the deck and around the dining table was more stylish than comfortable. It was our impression that the owners/property managers were more concerned that the guests not damage their cottage than that the guests have a good experience. The house manual had many pages of instructions on how to do things correctly but these were not followed by the expected recommendations for good restaurants, nice walks or other useful local information. Getting the front door open with the key was really a challenge...made easier once we got inside and read the instructions on how to use the key properly. We did, all in all, have a marvelous time..beds were comfy, towels luxurious and kitchen set-up just fine. I went with my husband and our 2 teenage girls. The house was beautiful. The location close to town (Eastsound) was great. The views from the house were incredible! It felt so peaceful and serene, like we were away from everyone and everything. It was just what we needed! The girls stayed downstairs which has it's own 'living room' area and bedroom which was perfect with teenagers!! They rented quite a few DVD's from the store in town (there is no cable TV which was also great and added to the sense of vacation from the rest of the world). My husband and I felt like we had our own separate, private place upstairs. We had an awesome time whale-watching, kayaking and going up to beautiful Mt. Constitution to see the incredible view. We have front row seats to see the 4th of July fireworks overe the bay. They were really fantastic!! We also took the ferry to Lopez Island for the day. Next time we plan to stay for a month and do more day trips off the island (to Victoria, San Juan Island, etc.). We loved Orcas Island! but ultimately accurate, modulo a st/rd error). 10am checkout is a pain. I would go back in a second. Terrific! Hope to see you soon again. I am now spoiled for any other vacation home.